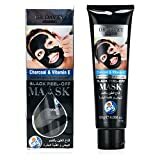 Mild blackheads, once a week, moderate blackhead, twice weekly, severe blackheads, 2 -3 times a week. 1. 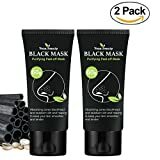 Unique ingredients Bamboo charcoal mud, effectively deal with the nose blackhead and acne, can penetrate the skin, quickly wipe the nose blackheads and firming skin, shrink pores, eliminate face hot poison to nourish skin whitening effect. 2. 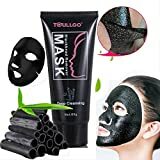 Ingredients: Water , Polyvinyl Alcohol ,Alcohol , Sodium Polystyrene Sulfonate , Glycerin, Charcoal Powder , Xanthan Gum , Phenoxyethanol/Methylparaben/Ethyiparaben/Ethylhexylglycerin , Parfum . 4. To properly use this product, apply an even thin layer on face avoiding direct contact with eyes, brow and lips. 5. 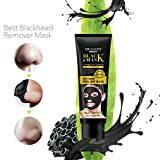 Friendly Note – The blackhead face mask is sold exclusively by OxygenBeauty . To enjoy genuine OxygenBeauty products and excellent customer service. So, if you meet any questions, please contact the after sale customer service , we will do our best to help you solve the problems . rather than leave a negative customer evaluation of. We will always be responsible for your items. Thank you for your kindness. 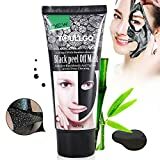 DEEP CLEANSING:Cleaning out of dirt and cuticle effectively on face,remove blackhead,acne,wrinkles,stain or oil spots and so on. 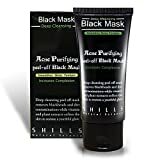 HELPFUL:Bamboo Charcoal Complex,effective blackhead remover,keep your face smoother,tender and brighter. 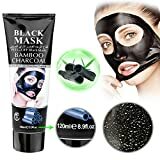 EASY TO USE: completely easy to use mask that comes with basic instructions so you can put it to use right out of the box 120g. NATURAL AND CRUETLY-FREE:Our ingredients come from natural sources and are 100% cruelty-free.this is a 100% safe to use and top quality product that will give you the results that you so much yearn for.